The findings were presented at the University of Bristol on Thursday. A spokesman from the university said the bones were the oldest surviving remains of an English royal burial. As the half sister of Athelstan, who is considered to have been the first king of all of England, Eadgyth had at least two children with Otto and lived most of her married life in Magdeburg, in what is now the state of Saxony-Anhalt. She died aged about 36. 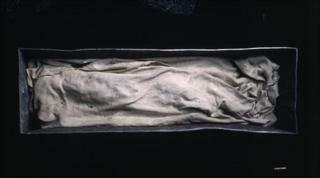 She was buried in the monastery of St Maurice but her bones were moved at least three times. She was finally interred in an elaborate tomb at Magdeburg Cathedral in 1510, wrapped in silk in a lead coffin. A study of the bones at the University of Mainz confirmed that the remains were those of a woman who died aged between 30 and 40. Professor Kurt Alt found evidence that she was a frequent horse rider and ate a high-protein diet, including a lot of fish, hinting at her high status. Director of the project Professor Harald Meller, of Germany's State Office for Heritage Management and Archaeology, said: "Medieval bones were moved frequently and often mixed up, so it required some exceptional science to prove that they are indeed those of Eadgyth. "It is incredible that we have been able to do this using the most recent analytical techniques." Crucial evidence came from the study of teeth in Eadgyth's upper jaw. Researchers at the University of Bristol's Department of Archaeology and the Institute of Anthropology at Mainz University studied strontium and oxygen isotopes that mineralise in the teeth when they form. Dr Alistair Pike, from the University of Bristol, explained: "By micro-sampling, using a laser, we can reconstruct the sequence of a person's whereabouts, month by month up to the age of 14." They found the isotope results exactly matched records of Eadgyth's childhood and adolescence in Wessex. Professor Mark Horton said: "Eadgyth seems to have spent the first eight years of her life in southern England, but changed her domicile frequently, matching quite variable strontium ratios in her teeth. Only from the age of nine, the isotope values remain constant. "Eadgyth must have moved around the kingdom following her father, King Edward the Elder, during his reign. "When her mother was divorced in 919 - Eadgyth was between nine and 10 at that point - both were banished to a monastery, maybe Winchester or Wilton in Salisbury." Her bones will be reburied in Magdeburg Cathedral later this year, 500 years after they were interred there in 1510.